AMSTERDAM — Feb. 6, 2018 — Biamp Systems, a leading provider of innovative, networked media systems, today announced the next generation of the company’s Devio® collaboration platform, introducing new products enhanced with unique features and patented capabilities that further improve audio quality, while also simplifying installation and programming for integrators. Devio is the industry’s first collaboration solution to offer Beamtracking™ microphones, a technological advancement that maintains signal integrity and audio quality even as meeting participants move about the room. 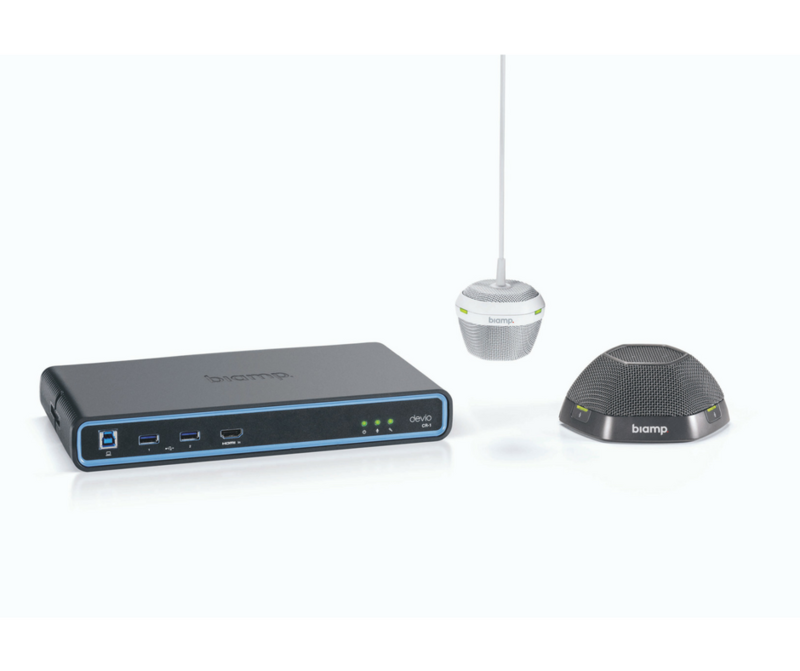 The new Devio models offer enhancements that broaden room design flexibility, deliver improved video capabilities, and expand support for VoIP/POTS handsets and mobile devices. Many conference rooms feature microphones or integrated audio devices that are static in nature, restricting participants’ ability to move around a room and still be clearly heard by people joining remotely. Equipped with Biamp’ patented beamtracking technology, Devio microphones not only identify and lock onto a signal source, but also track that source as they move around the room. This ability to capture participants’ conversation as they collaborate, while intelligently mixing conversations from around the table, allows far-end conference participants to experience a more natural-sounding conversation as it unfolds. Devio is a cost-effective, uncomplicated USB audio interface that provides users of web-based conferencing systems with an exceptional AV experience. Designed for huddle rooms and other small meeting spaces, Devio supports a variety of room designs for computer-based conferencing including a BYOD approach or connection via a dedicated in-room PC. Devio CR-1: A high-performance fixed configuration DSP optimized for small rooms and ready for the demands of BYOD use cases. The new Devio SCR-25: Adds to the capabilities of the SCR-20 with support for Bluetooth® wireless technology and a wired VoIP/POTS headset interface. Devio DTM-1 (tabletop) / DCM-1 (ceiling) microphones: Both Beamtracking microphones feature Biamp’s patented technology, require minimal setup, and dynamically track conversations from around the table or room. With Devio, limited table space does not need to be consumed by the room’s conferencing technology. The Devio base unit can be mounted under the table or surface, or behind the display. Multiple speaker options are supported, including a ceiling speaker powered by the integrated amplifier, powered speakers connected via RCA line-out, or even the integrated display speakers. The Devio microphone form factors require little or no table space while being centrally positioned within the room. The new Devio SCR-20 and SCR-25 are sold bundled with either the DTM-1 or DCM-1 microphone, and will be available in the second quarter of 2018. More information on Biamp’s full line of products is available at www.biamp.com.